The growth of bike share programs is gaining momentum in the US. 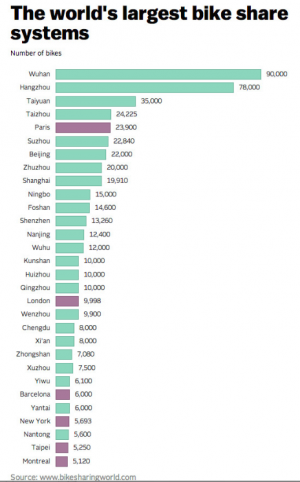 But this growth is absolutely dwarfed by the explosion of bike share programs in China over the last couple of years. The country now has more than 400,000 bike share bikes in operation across dozens of cities with programs, with the vast majority installed since 2012. To put this in perspective, there are an estimated 822,00 bikes in operation around the world — so China has more bikes than all other countries combined. The individual country with the next-highest number of bikes, France, has just 45,000. Here are the 15 countries with more than 3,000 bikes in operation, with data coming from the Bike-sharing World Map, a database maintained by Russell Meddin and Paul DeMaio.